Perhaps it is because of his mixed heritage of Afro-Colombian, criolloand Indigenous blood, that gaitamusic speaks to the passions of Colombian artist and teacher Martin Vejarano. Martin sees the beginning of a renaissance in Colombian culture where “culture cuts through violence and discrimination and unites people” and gaita music provides the much needed healing. And it’s no wonder, considering gaitamusic brings together the three prominent cultures of Colombia using the gaita, a native flute of the Indigenous Kogui people, the drums used by African community, and Spanish song. 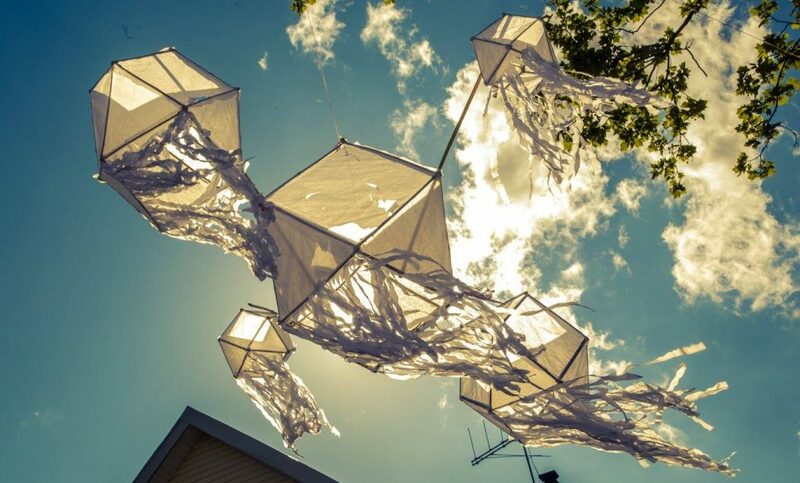 Born in Bogotá, Colombia, Martin was surrounded by the arts and culture from early childhood. His mother, Piedad Avila, was a founding dancer in Ballet Cordejera, a traditional Colombian folk dance troupe launched in the 1960s led and directed by Jacinto Jaramillo. Martin’s father, Juan Jose Vejarano, is lover of classical guitar, a filmmaker and university professor in Bogotá. Martin describes a home filled with music and the sounds of heated debates within the extended family regarding the merits of all kinds of music and dance– traditional, Colombian, classical. At the age of seven Martin began acting on local TV shows, in film documentaries, TV series, commercials and comedies. By fourteen he began playing drums (on a trap set) and by the time he reached eighteen, music began to play a more important role in his life. In 1996 he began studying jazz when he entered the University INCCA in Bogotá. Two years later Martin decided to pursue his own research in traditional music. During the next few years, Martin traveled to remote areas of Colombia to research Indigenous traditions and the strong percussive influences of the African diasporic community. In 2000 Martin moved to New York City. Once in the Big Apple, he learned English, practiced drumming and made valuable contacts. It was during this time that Martin met a friend of his traditional music mentor Gilbert Martinez: Ihan Betancour, an Afro-Colombian musician then living in New York. Ihan is the grandson of one of Colombia’s famous folklorists and dancers, Delia Zapata Olivella. Together with Ihan, Martin began playing gaita music in Washington Square Park and making transcriptions of traditional music. 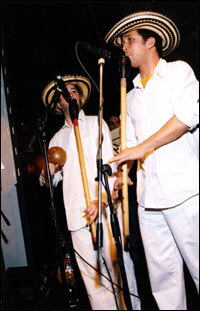 Martin contacted other Colombian musicians who had come to NY and in time, the group La Cumbiamba eNeYé was formed with Ihan and Martin as directors. 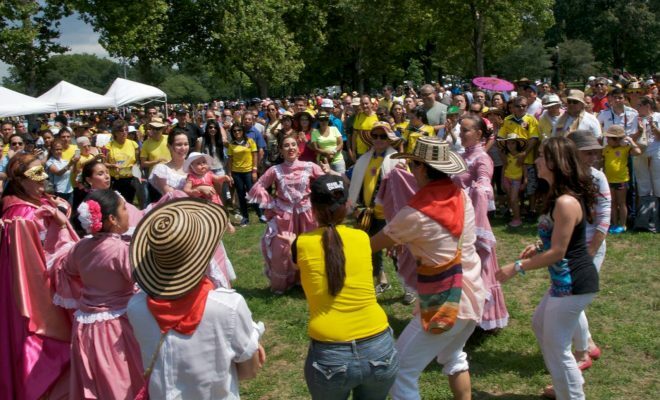 The name La Cumbiamba eNeYécame from the term cumbiamba—the traditional outdoor celebrations particularly found on the northwestern Caribbean coast of South America. 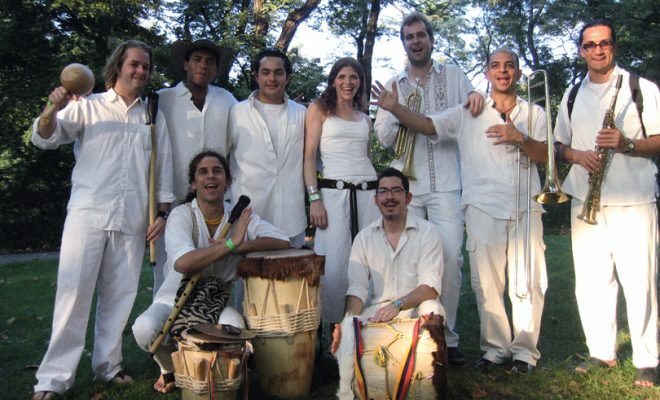 La Cumbiamba eNeYé experimented with different styles and decided to focus on the coastal music of Colombia especially on the traditional cumbia and gaita formats as well as the marching band formats Banda Pelayera and Chirimia. Gaita music is performed with three drums, maracas, and two gaitas. The gaita itself is made from the cardón cactus, found in northwestern coast of Colombia. The Indians of the region make smaller gaitas using the cactus wood and forming a unique head of beeswax and charcoal powder with a mouthpiece of duck quill. Possibly over time the descendants of African slaves influenced the design of the flute and the gaita became larger to gain volume as Afro-Colombian drums were added to the form. The flutes are played in pairs—the female gaita has five holes and carries the melody while the male flute with two holes accompanies the female flute as the artist simultaneously plays the maracas. Gaita music is considered the pre-cursor to modern cumbia music, as over the years other instruments such as the accordion, horns and electronic instruments have been added. Martin enjoys the soulful sound of the cardón gaita, and makes them himself. Each fall he can be found in Pelham Bay Park in the Bronx, collecting feathers for the mouth piece. Nonetheless he is also experimenting with pvc (plastic) gaita, as he is taking the instrument into new musical formats and needs to experiment with different keys and tonalities. Martin also thinks that the plastic flutes can help to ease the deforestation of the cardón as the gaita becomes more popular in Colombia. In 2002, Martin and his friend Alexandra Posada entered an open call by National Geographic for mini-documentaries. Over a period of four months, they traveled throughout Colombia shooting video of regional music and culture, interviewing and learning from master artists. Using the footage of the documentary, Alexandra secured funding for a US tour with the gaita music masters from Colombia. Once in New York the legendary group Los Gaiteros de San Jacinto recorded an album. Most of the artists featured on the CD had been living in poverty and isolation in San Jacinto, Colombia. The end result was a CD called: Un Fuego De Sangre Pura (A fire of pure blood) which was bought by Smithsonian Folkways Recordings and in 2007 it won the Latin Grammy Award for Best Folk Album. Martin became the artistic director and manager of La Cumbiamba eNeYé in 2003. Ihan Betancourt returned to Colombia due to the death of his grandmother Delia and his uncle Manuel Zapata Olivella. Throughout the years they did research in Africa on the roots of Afro-Colombian music. Their home and collection had been named an Object of Cultural Patrimony in Colombia, and Ihan was needed to direct the transition. Without Ihan around, Martin continued to work on the musical development of the band with his fellow Colombian musicians Sebastián Cruz and Nilko Andreas Guarin. La Cumbiamba eNeYé continues to perform throughout New York and the USA with regular performances on Tuesday and Friday nights at the Rose Live Music in Brooklyn. As the group’s popularity groups, so does the challenge of keeping them together. Sebastián Cruz and Nilko Andreas recently earned their masters degrees from the Manhattan School of Music while Martin graduated from the Brooklyn Queens Conservatory of Music. He has returned to jazz but this time he hopes to use the tools of jazz composition to incorporate Afro-Colombian rhythms in jazz music. With so many projects going at once, Martin prioritizes keeping the traditions alive with performing, transcribing and composing. At present his is in pre-production for La Cumbiamba eNeYé’s second CD. The group released their first CD entitled, Marioneta to rave reviews in 2006. The new CD looks to be a big project: a double album with gaita music recorded with the masters in Colombia on one CD and brass band recorded with the band in NY on the other CD. La Cumbiamba eNeYé’s label, Chonta Records, agreed to offer the double CD for the price of one. Martin describes the CD as “an exercise of happiness because we love to make music.” With such a positive attitude, there is no doubt that the new CD will continue to bring all kinds of people together. 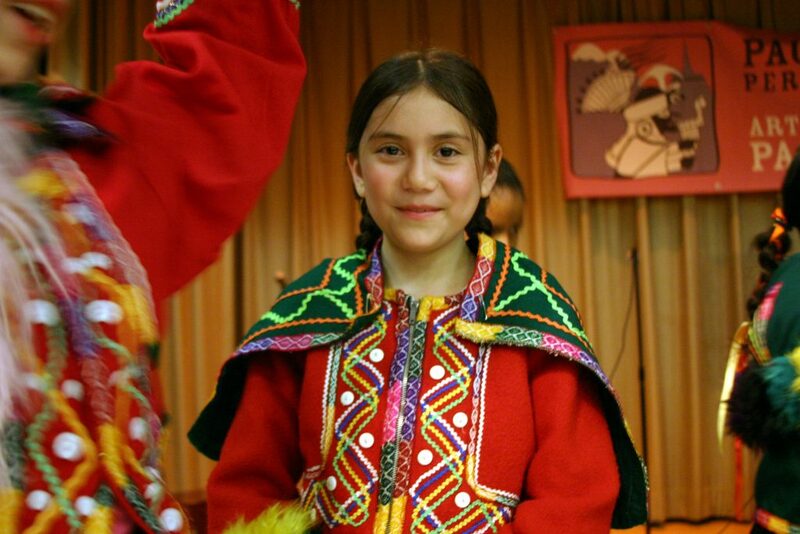 Gabrielle M. Hamilton is a Folklorist and was Project Director of the Center’s Colombian Community Cultural Initiative and the Pachamama Peruvian Arts Initiative.